Carrying bag custom designed to hold Target Meister’s Dirty Harry and Rowdy Yates Target Stands. Provides extra portability for any shooter who needs to set up hundreds of yards down range. These high-quality bags are hand crafted in Phoenix, Arizona. Each one is sown by hand from 1,680 denier ballistic nylon and double stitched. It's material and construction make it highly resistant to abrasion and tearing. It contains two pockets that can be used to hold target stand accessories, such as stakes, rope or cable for tie-down, and target markers. It is also handy for carrying our cardboard target backing rolls, paper targets, and 1 × 2 wood strips. Try it out. Hike into the woods or ride your bike to the gun range with your entire target setup over your shoulder. If it doesn't makes your life easier when setting up for target shooting, return it for a 100 percent refund. The material for this carrying bag is currently on backorder. If you want this bag, please email us with your name and quantity needed. We will then contact you as soon as they are available for order. We apologize for inconveniencing you. Thank you. The carrying bag fits either the Rowdy Yates target stand or the Dirty Harry, shown in Figure 1. When you're heading to the gun range, or down range, both hands are usually filled with a combination of a rifle, targets and backers, ammo, wood furring strips, etc. So why not throw your target stand over your shoulder to ease the load? The carrying bag gives you that portability convenience. 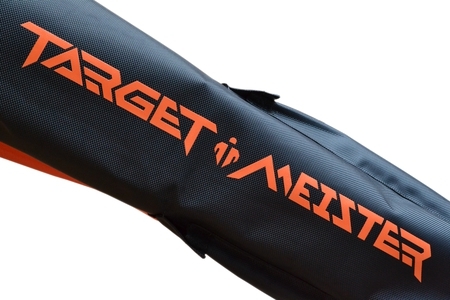 The bag is resistant to abrasion and tearing and makes the perfect, protective storage device for your steel Target Meister target stands. Why not protect your investment? The bag will help keep the beautiful powder coat finish on your stands looking like new for years. The ballistic nylon is backed with polyurethane which waterproofs the material. Therefore, an extra Target Meister bag is also ideal for storing your cardboard backing rolls and targets as shown in Figure 2. We all know that wet, warped cardboard makes for a horrible target backer and water-damaged targets are garbage. The bag may also be convenient to temporarily protect your gun from the occasional sprinkle. The bag contains two side pockets for storing target stand related accessories, such as target markers, tape, adhesive spray, or staple gun. The skinny pocket shown in Figure 3 measures 12″ × 2-½″, which perfectly holds eight 10″ spikes. The fat pocket measures 12″ × 4-½″. These pockets were specially designed to hold a Target Meister staking system, which is still in beta and should be available online soon. Target Meister uses only the most cutting-edge materials available to handcraft our target stand carrying bags. Our fabric of choice is 1680 denier ballistic nylon for its intense, high-tech synthetic style and exceptional strength. The beautiful 2 × 2 basket weave of ballistic nylon makes it the top choice for rugged applications where durability and abrasion resistance are paramount. Additionally, the filamental weave gives ballistic nylon superior tear strength over traditional heavy-duty nylon synthetics, such as Cordura. Each bag is hand sewn by our expert seamstress, who also took part in the design of the bag. She double-stitches every pocket and seam. The bag strap is 2-inch polyester seat belt webbing. This webbing has a hefty 6,000 pound tensile strength rating. It will not shrink, rot, mold, or mildew and contains UV inhibitors to protect it from sunlight decay. Like ballistic nylon, it is also very abrasion resistant. We performed many hours of research to find the perfect material to build our carrying bags. We considered many materials but ultimately chose 1680 denier ballistic nylon. We'd like to present a short history and some facts about this amazing material. Ballistic nylon was conceived as an early form of body armor (flak jackets) for protecting U.S. servicemen from shrapnel and other indirect, low-velocity projectiles in war zones. Today it is used in demanding applications where ultra-durable fabric is compulsory, such as high-end luggage, chew-proof K9 beds and horse blankets, indestructible prison mattresses, and skin-on-frame kayaks. ASTM International publishes some 12,000 standards that are used around the world to improve product quality, enhance safety, facilitate market access and trade, and build consumer confidence. To measure the durability of 1680 Denier Ballistic Nylon (1680D), CODi compiled test results from three independent testing facilities. These facilities utilized three ASTM standards to test the tensile strength, tear strength, and abrasion resistance of 1680D fabric. How Durable is 1680D Ballistic Nylon? The ASTM D5034 test method determines the breaking-strength of fabric. A breaking-force of 559 inch-pounds was required to tear a 1″ × 2″ strip of 1680D. Once fabric is torn, the ASTM D2261 test determines the force required to continue the tear by pulling the tongues of the rip. A pulling force of 88 inch-pounds was required to continue tearing 1680D. In the ASTM D3884 test method, the fabric is placed between two counter-rotating silicon carbide wheels with 1,000 grams of pressure applied. The 1680D withstands 533 rotational cycles before showing wear.